The music of Leipzig-born Richard Wagner needs no introduction since his reputation grew considerably as he began to focus his energy on composing operas. As composers mature, we are aware that their style and approach to composition changes and becomes more sophisticated. Wagner’s later operas when compared to his earlier ones demonstrate this quite clearly. But what about the young Wagner? Did his early compositions, written when he was a late teenager, hold promise and provide the foundation for the transformation that was to later take place? This CD allows the listener to hear these beginnings in two compositions written between 1832 and 1834. Perhaps our attention is better directed to Wagner’s Symphony in C major for an assessment of his quality as an orchestral composer, since the Symphony in E major was not orchestrated by him. The C major displays a good compositional technique, already making extended use of the French horns. The listener is very much reminded of Beethoven and from these examples it is clear that Wagner was a follower of this master’s symphonic style. He admitted that the work was modelled on Beethoven’s Seventh and Eighth Symphonies, performances of which Wagner had attended four years earlier. This helps explain the influence Beethoven had on him – He even wrote a piano transcription of the Ninth. Only a fragment exists of his Symphony in E major and its orchestration was completed by Felix Mottl (1856-1911), an Austrian conduictor who had studied at the Vienna Conservatoire. Mottl conducted many performances of Wagner’s operas at Bayreuth and so had a close association with the composer. After Wagner’s death, Mottl orchestrated the manuscript and must have chosen the instrumentation. Although he achieved successful results, it cannot be fully regarded as what Wagner have wished to be heard. The Adagio cantabile is particularly engaging and leaves the listener wishing for more. During the period of composition of the symphonies,Wagner took up work in the theatre as choirmaster and musical director and one might have expected some influence of Weber or even Rossini, but these are not evident to my ears. A criticism of both symphonies is that their construction meanders, making repetitive use of figures and phrases. 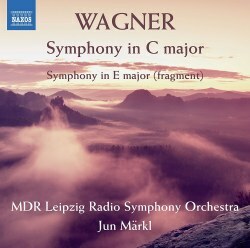 Throughout, Wagner tends to underuse the top strings, which could have usefully carried a decorative melody line; where they do contribute it is a pity that they are not brought further forward by the engineer for this recording. I did not recognize any motif that might have been later used in his early operas like Tannhäuser, the lasting impression is more a tribute to Beethoven. The notes in English and German by Katy Hamilton provide interesting detail that gives insight into the background surrounding these early compositions. However, there is a discrepancy between the composition dates as shown on the inlay and those in the notes. The recording is excellent and bathed in a warm acoustic that does justice to the fine playing of the MDR Radio Symphony Orchestra. Jun Märkl conducts with a commendable degree of panache.